Patna, Oct 25 Bihar Chief Minister Nitish Kumar has found his inspiration in Sher Shah Suri, the 16th century founder of the Suri dynasty known for initiating path-breaking reforms. 'Sher Shah Suri is my idol. He is my inspiration,' said Nitish Kumar, who has been trying to put Bihar on the path of development, after visiting the Muslim ruler's tomb in Sasaram, about 150 km from here, Wednesday. 'We all respect and remember him for his developmental work,' he said. 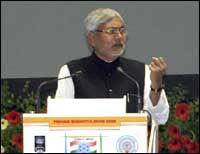 Nitish Kumar has been widely described as 'Vikash Purush' or 'man for development' by leaders of the National Democratic Alliance (NDA) for initiating numerous development projects in Bihar. Sher Shah Suri (1472-1545) is also known as Sher Khan or the Lion King. Although his empire was short-lived, from 1539 to 1545, he left a deep imprint on the minds of the people - and history - by carrying out infrastructure projects, like building long stretches of roads, bridges, wayside inns etc. The chief minister promised help for preservation and protection of Suri's tomb, which is facing threats from pollution and encroachment. The five-storey mausoleum stands on a tank whose water has turned acidic, posing a threat to its survival. The Archaeological Survey of India (ASI) two years back warned the state government about the ecological threat to the tomb. ASI officials said the tank's water had turned acidic and was polluted due to its use by local residents. Untreated sewage and effluents flow into the tank, which is spread over a large area. 'The tank's water is posing a serious threat to the mausoleum's life,' an ASI official said. The ASI official also urged the state to ban immersion of idols in the tank and restrict any construction within a radius of 200 m of the mausoleum. The district administration allowed the immersion of idols in the tank from 1980 after a pond in the neighbourhood dried up. Encroachments have come up on the mausoleum's premises. Though the state government claims to have spent Rs.700,000 to Rs.800,000 on the tomb's maintenance, it appears to have been done only on paper. The tomb was declared a national heritage under the Ancient Monuments and Archaeological Sites and Remains Act (1958). The ASI took it over for preservation and protection in 1938.